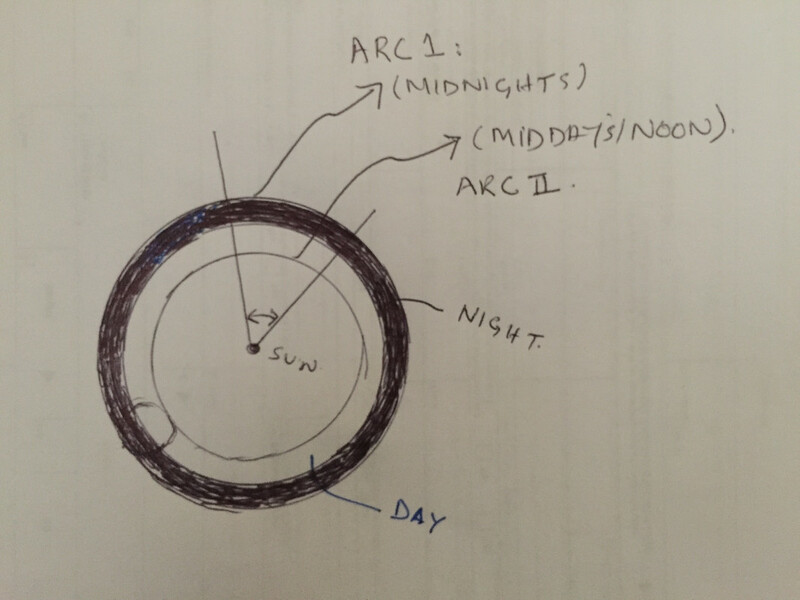 Flat Earth General / Does time dilate during nighttime when the earth orbits the sun? The following diagram (not to the scale) depicts the path traced by earth in its orbit (either circular or elliptical) around the sun. 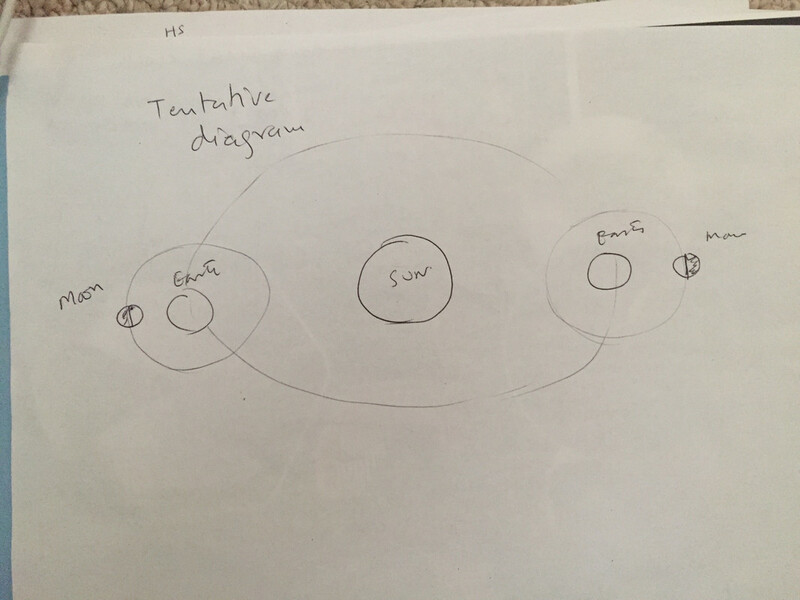 Since the moon doesn't rotate (spin) like the earth does on its axes, therefore, shouldn’t moon change side for sunlit for us due to the effect of the synchronous rotation when both the earth and the moon are imagined together at any two opposite positions in their orbits around the sun? Spherical Earthers: Would observer B see the letters "sun or moon" in the picture upside down? 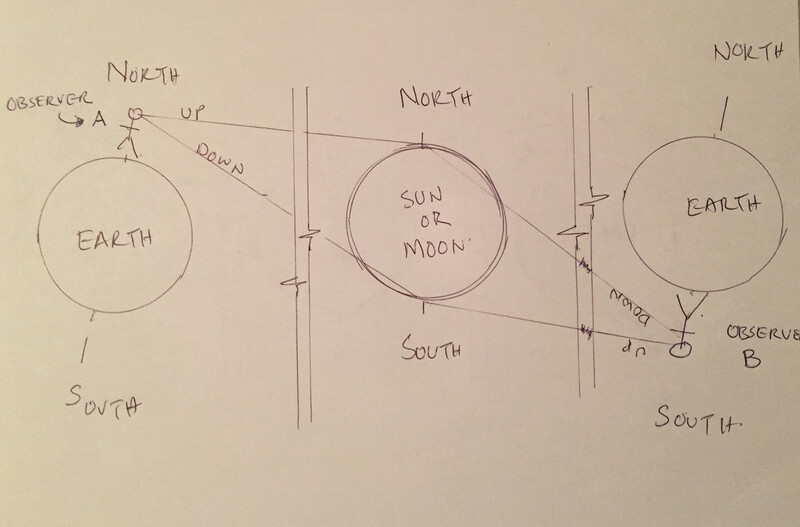 Both Flat and Spherical Earthers: Is there any authentic picture or video of the moon or sun available which is taken from the south pole of the earth in order to see if the spots on the moon or sun look upside down / inverted. Would time dilate at the same rate in the following light clocks if moving at the same speed in the same direction relative to the stationary observer? Flat Earth General / How does an Apple overpower the inertia of an Earth? How does an Apple overpower the inertia of an Earth if both gravity and inertia are real? How much is a force other than gravity needed to overcome the inertia of an earth in the absence of all other forces? Flat Earth General / Are all masses like black holes? Does gravity become infinity where the center of gravity of a mass lies? How are two objects attracted to their center of mass with F=GMm/d^2 which is less than infinity? Flat Earth General / Does "g =GM/d^2" best in situ in mathematical equation of "F = GMm/d^2 = mg"? Both earth and an apple (smaller objects) accelerate toward each other due to the force of gravitation but an apple appears a lot to the earth due to its greater acceleration as compared to the earth toward an apple, which is so minuscule to be distinguished. Since the difference in masses is mammoth therefore it seems that not only the earth is stationary as compared to an apple but also the reduction in on-center distance "d" occurs due to falling of an apple ONLY (in its acceleration mode), but verily, both masses are changing their positions and hence on-center distance decreases due to the falling of both masses in their higher derivatives of motion (complex motion) before they strike each other. This can easily be observed if the difference in masses is not so huge or if we consider the following two identical spherical masses (from point to celestial), which are separated by on-center distance “d”. First Mass = M1, Second Mass = M2, M1 = M2 = Identical, Centre-to-Centre distance b/w M1 and M2 = d, d1 = d2, d1 + d2 = d, Gravitational acceleration of M1 = g1, Gravitational acceleration of M2 = g2, g1=g2 and “c” be the mid point of “d". Although, both M1 and M2 strike each other at “c” as per universal law of gravitation but since none of the M1 or M2 is stationary at “c” therefore neither M1 covers a distance d1 with g1=g2 nor M2 covers a distance d2 with g1=g2 on their road to “c”. Acceleration g1=g2 is only possible if either M1 or M2 is stationary at “c”. The earliest imaginable motions of M1 and M2 towards “c” might be due to the generation of g1 & g2 and the reduction in d (reduction in "d1" and "d2" equally on both sides of “c”) as well but after that both M1 and M2 start moving toward “c” at higher types of motion (such as gravitational jerk, jounce, crackle, pop, lock, drop etcetera or complex motion) as d1 and d2 decreases equally on both sides due to the change in positions of both M1 and M2 while on their ways to "c". Both M1 and M2 move at much faster rate due to the formation of the complex motion instead of simply with accelerations before they hit each other at “c”. The actual striking time of M1 and M2 at "c" is much less than estimated by g1 and g2 combined. So is F=GMm/d^2 well formulated? Addendum: As gravity is universal therefore physical objects orbits other physical objects and hence causes the motions of planets, stars, and galaxies in the universe. Let there is a triplet of A, B, and C on an asteroid initially. A stays on an asteroid while B and C set out for a long space journey with high speed (say 0.5c and 0.9c) at the same time in the same direction relative to A. Assume each 10 years old at the time of departure. B and C are gone for 60 years relative to A. Afterward, B and C return home at the same time and reunited with A on an asteroid. What would be the age of A relative to B and C? What would be the age of B relative to C and A? What would be the age of C relative to A and B? Since A, B and C can have only one physical appearance and one age. Thus who would be right on the physical appearance w.r.t their respective time of one another especially that of A? Make it more simple: Let there are 96 clone brothers. Clone #96 stays on an asteroid while the rest take off at the same time with the following speeds relative to Clown#96, in the same direction for their long synchronized space journey. Assume each 10 years old at the time of departure. All 95 clones gone for 60 years relative to clone 96. Afterward, 1 to 95 return home at the same time and reunited with clone 96 on an asteroid. Each clone can have only one age and one physical appearance therefore who would be right on the physical appearance of #96 clone? Imagine two similar rings A and B. Radius of A is R1 while B is R2. 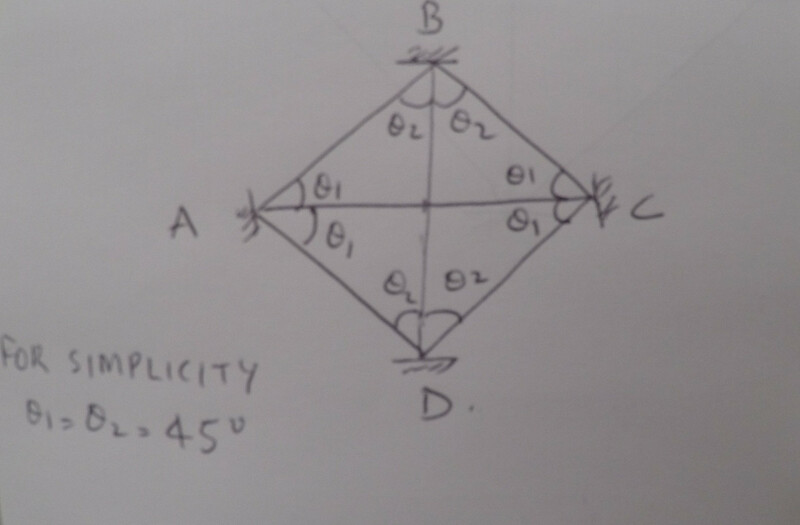 Both A and B share the same center. Gravity force b/w A and B is F=GMm/ d^2, where d = 0. Thus, would you be able to separate A and B? Flat Earth General / Does weight decrease if its mass increases - Theoretically. Is the weight of a mass of 1kg of a sphere on real earth, which is equal 9.8 N, greater than the weight of identical imaginary earth on our real earth? Things can be ignored at this level but not at when the mass “m” of above said sphere increases gradually till it reaches the size of earth - two identical earths - An imaginary earth on our real earth. Mge = Mge or ge = ge; gravitational accelerations “g” of both identical earths are the same (9.8 m/s/s/) but acting in opposite directions and hence cancel each other. Thus both the earths are weightless, however, physists say that gravities don’t cancel each other. Since the center of gravity of matter depends upon the shape of object therefore how do we know the unknown mass we buy in market is equivalent to the known standard mass on weigh balance when theoretically, the center to center distance b/w the known mass & earth AND the center to center distance b/w the unknown mass & earth are differ and the same analogy is applied to measurements of division of all units of mass such as gm, kg etc. Flat Earth General / Is time absolute or can be dilated and contracted as well. There are infinite ways to design a light clock but here is one of the simplest light clocks shown in the link. The position of the four mirrors A, B, C, and D are shown in the light clock. The clock is not to the scale but the distance AB=BC=CD=DA and theta 1/one is equal to theta 2/ two = 45 degrees. The direction of the pulse can be from A to B to C to D to A and so on or in opposite direction. A suitable/desirable scale of the clock can also be chosen and similarly its orientation as well. A pulse of light takes 4 seconds to complete a path of ABCDA if fired at point A for all stationary observers. Let the clock starts moving at very high speed in space relative to another stationary observer “Os” on a stationary asteroid. Would the clocks of Oc and Os be synchronized relative to each other if Oc were moving relative to Os? Inertia is the tendency of a body to resist a change in its motion or rest. Acceleration is the rate of change of velocity while jerk is the rate of change of acceleration. Earth moves faster when closest and slowest when farthest in its elliptical orbit around the sun, therefore, why don’t inertial forces which produced when an earth changes its orbital speed and ultimately acceleration (causing angular jerk) affect our daily life, large water bodies, internal structure of earth, sway in super high rise structures etc? Sidereal day: time taken by the earth to rotate on its axis relative to the stars - is this for the stationary earth as people were thinking back in the past that the sun is revolving around the earth. A sidereal day: time taken by the earth to rotate on its axis so that the distant stars appear in the same position in the sky. Since observer on earth changes its position in the orbit of earth due to the revolving of earth around the sun, therefore, would the position of stars in sky be changed due to the recording of time at two different points in the orbit of earth? Also, the sidereal year is 20 min 24.5 s longer than the mean solar year. This means it will be one hour longer in 3 years, 24 hrs in 72 solar years and 48 hours in 144 years and so on. Thus would the number of nights in 72 sidereal years in which stars were seen be equal to number of nights in 72 solar years. Do airplanes make a correction for the curvature of an earth when they fly at the same altitude (elevation) for long hours/ period of time? - I know surveyors do. Flat Earth General / Who is right Galileo or Newton? Now according to Newton ge > gbb> gf so the striking time of earth and bowling ball will less than the striking time of feather and earth if drop separately or at the same time. The average curvature of the earth is 7.98 inches per mile. So it would be1596 inches (133’) in 200 miles. Let we have 400 miles perfectly or ideal leveled runway. A fighter jet starts its journey from one end of the runway and increases Its speed till it reaches to a maximum speed of 2500 km/h (or increases its speed beyond the limit which requires for its flying in the air) in the first stretch of 1 or 2 miles from the starting end. So will this jet lift off the ground automatically in air due to a curvature of the earth? The said jet takes off in a normal way. After few minutes it turns its nose upward and shoots straight vertically up into the sky. This jet is now making 90 degrees vertical angle with the tangent of curvature of the earth just below it. After some time, the pilot decides to fly on the imaginary line in an airspace, which is parallel to the above tangent. So he abruptly turns its nose down (90 degrees) and starts flying on his desired line in the airspace. So will this jet gain elevation if fly for 100 miles on the same said line? The First and the Last Noon of the solar year don’t coincide. This means solar noon lags by about 6 hours each year and about 24 hours after every 4 years. Days and Nights flip after two years. We update our calendar after 4 years for our own convenience by adding Feb 29. Apparently, we age 365.25 x4 +1 =1462 days in 4 solar years but the actual figure is 1461 days due to the reversing of aforementioned unnoticeable one day. The earth starts its next year (5th) in the orbit but in reality, we are 24 hrs behind the earth in its orbit around the sun. This small change in one year reverses not only days and nights but also seasons latently with the passage of time but neither we adjust our clocks for above-mentioned unnoticeable 24 hrs nor we adjust this in our calendar.